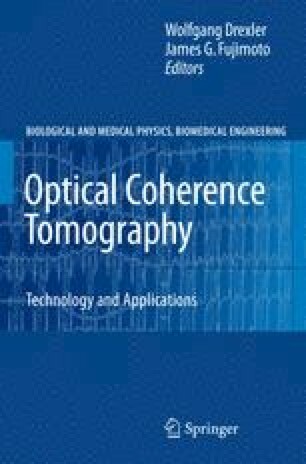 Fourier domain optical coherence tomography (FdOCT) [1, 2] provides significant improvement in detection sensitivity and imaging speed as compared to time domain OCT [3–5]. The delay and magnitude of backscattered or back-reflected light detected by any OCT system carries information about the axial structure of semi-transparent objects. FdOCT devices reconstruct the sample structure by spectral analysis of the spectral interference fringe signal. FdOCT detection can be performed in two ways: Spectral OCT using a spectrometer with an array or matrix of photodetectors (CCD, CMOS, or photodiode arrays) [1, 6–8] or swept source OCT using a tunable laser source [1, 9–16]. Spectral OCT has demonstrated superior imaging speed as compared to time domain OCT when applied to ophthalmic imaging in the anterior eye segment and the retina [7, 8, 17–23]. Spectral OCT and Swept Source OCT are also promising for three-dimensional ultra high resolution imaging [7, 17, 20, 21, 24]. An advantage of FdOCT is the possibility of having direct access to the spectral fringe pattern, enabling a wide range of novel applications such as tissue absorption measurement  and tissue contrast enhancement . Additionally, the high speed combined with simultaneous registration of all spectral components (spectral OCT) provides stable phase information [27, 28]. The availability of signal phase information due to coherent signal detection is one of the most important advantages of OCT. It allows pushing the resolution limits down to the nanometer range and extending the capabilities of FdOCT from the purely structural toward a potential functional imaging modality with high temporal resolution [29–31].